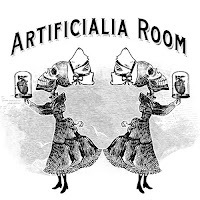 Burning Moon's Inside advice: Artificialia Room Giveaway & Review! The Halloween season is the perfect time of the year to show off all of your spooky decor and any oddities you've collected throughout the year. For me my home is Halloween year round so I love finding new pieces that can not only be used during Halloween but also as an addition to my spooky and creepy decor. 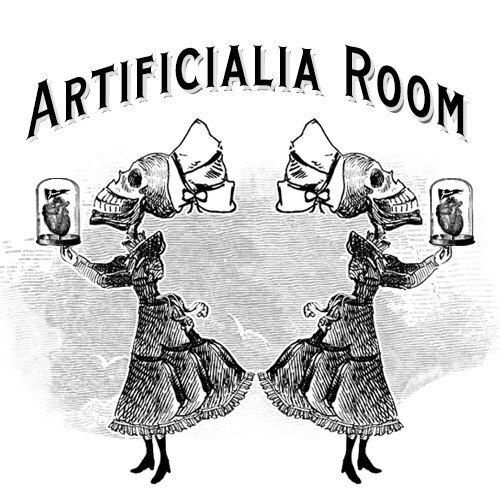 I recently stumbled upon a spooktastic etsy shop called The Artificialia Room who sells a range of oddities, curiosities and unusual miniature domes. Shop owners LaBrulee & LeChantilly were kind enough to let me host a review and a giveaway of their unique and beautiful master pieces. For my review I received the Anatomical Heart in a glass dome display which stands at only 2.75 inches but it features a ton of details all within one small space. Before I get to the review on the actual piece itself I want to state that I love how they ship these domes, as you can see the product packaging they are sent in is clean, well put together and very professional but that wasn't the only thing I liked about how they shipped this. They had it in a small box and not only did they put padding inside of the box you see above but there was padding inside of the shipping box and the piece was taped to the side of the box to keep it from sliding around during shipping and they include a miniature card and envelope. The Anatomical Heart in a glass dome display can be purchased for $29.90 and it is made to order so it will take 5-7 days to ship. Now onto the Anatomical heart display,this piece is made from Resin, Modeling Clay, Fine Branches, Fine Arts Paper, Colored Reindeer Moss Preserved, 1,6 mm Thick Borosilicate Glass Dome. When the dome is open it does have a slight chemical paint/resin smell to it which isn't potent you can only really smell it if you are examining this piece up close. The heart looks great and realistic for how small it is, it even looks like it has layers of muscle like a real human heart does and appears to be made of the same type of materials. I like the plaque included as well, if you don't like the plaque or the flag included you can customize them for an extra $2.50 which is a great deal and opens the door for a lot of gifting options. The red moss and brown wooden base help add character and charm to this piece to tie everything together nicely. I think this is a wonderful piece and Rumpelstiltskin agrees as well. They have a fantastic selection of pieces to purchase from, each time I go back to look at their shop I think "I love that one, I should have selected that one" haha so in reality I pretty much would love to own one of everything from their shop. One lucky winner is going to win ANY glass dome piece of their choice. Giveaway entry question: Please leave me a comment letting me know which dome you'd select if you won. These domes are amazing! I love the gothic style, with humor :) I think i would have to choose the brain with the fork, titled "food for thought", What a great halloween idea! I loved them all but i would pick the Zombie Unicorn. This is such a cool shop! I want the unicorn zombie. I would either choose the heart you've reviewed or the Butterflies in a Glass Dome. So many awesome choices. The Gold Anatomical Heart and Key is really unique. I also would choose the heart. It has special meaning to me. It would be a constant reminder to me to keep protecting my heart. I had a heart attack at 33. I like several of them. Terrarium Skulls Moss might be my fav. I love all of the butterfly dome sculptures but I would choose the Terrarium Skulls Moss - Miniature Glass Dome Display for my son. Lots of neat and interesting stuff on the Etsy site! I would choose the Butterflies in my Stomach - Anatomy in a Glass Dome. Thanks. Terrarium Skulls Moss - Miniature Glass Dome Display is the one I like the best but I love the Heart as well. Really loving the Terrarium Skulls Moss!